Dolphins boast amazing eyesight in addition to their other well-developed senses. A dolphin relies on his eyesight day in and day out. From avoiding predators to finding and eating food, the dolphin's eyesight is essential to the dolphin's survival. For humans, swimming with eyes open is difficult. Dolphins, meanwhile, have the pleasure of awesome eyesight both in and out of water. Their eyesight is especially in tune underwater. The lenses and the cornea in a dolphin's eyes naturally auto-correct for the difference in refraction of light underwater and that above the surface. 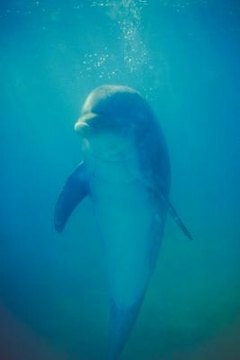 If a dolphin's eyes didn't have this built-in ability, he would be near-sighted every time he popped his head out of the water. A dolphin's retinas contain two kinds of cells -- rods and cones. Rod cells allow a dolphin to see even in dimly lit areas. Some marine-life researchers believe other forms of marine life similar to the dolphin, such as whales, are basically colorblind. Unlike land mammals, dolphins are not able to completely crash out and enter full sleep mode. They must stay half-conscious at all times to stay on the lookout for predators and to remind themselves to come up for air every so often. In a sense, a dolphin sleeps with one eye open: Half a dolphin's brain goes to sleep while the other half stays alert; at this time, only one eye is working. Dolphins are able to see beside them, in front of them and even behind them because their eyes are placed laterally, one eye on each side of the head. Unlike human eyes, which act together to view things in their range of vision, a dolphin's eyes act independently. One pupil may be staring intently at something while the other pupil is relaxed and constricted.